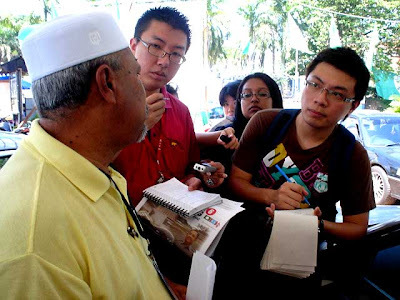 With this by-election the war between Barisan Najis and Pakatan Rakyat has shifted from the political to the spiritual dimension. 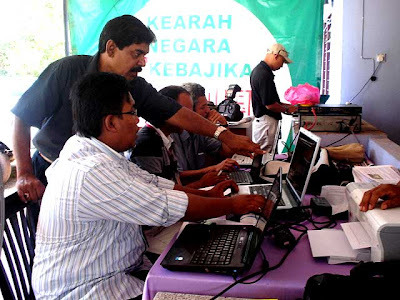 BN is out in full force with massive amounts of money and an overwhelming extravagance of banners, flags and buntings - while Pakatan Rakyat has to contend with mostly insular, agrarian voters with minimal access to digital information. Will the immorality of BN's arrogance, greed and violence swing the votes once again towards CHANGE... or will Bagan Pinang vote for the status quo and the devil they know? 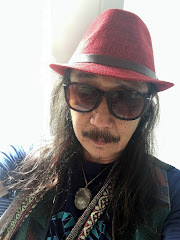 I join the Barisan Rakyat Bloggers in Port Dickson, led by Bernard Khoo aka Zorro, to tap directly into the by-election fever. Claire and Fauzi can't resist snapping away at the sunset while Duke keeps a watchful eye for potential Rempit attacks. We manage to finish our sup tulang and keropok unmolested. 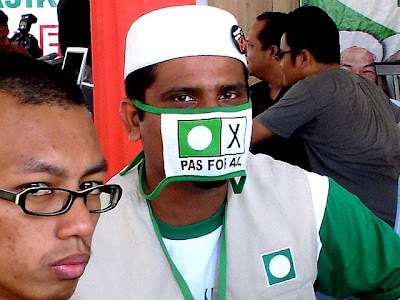 At a Pakatan Rakyat press conference a PAS volunteer masks himself against the deadly B1N1 virus. 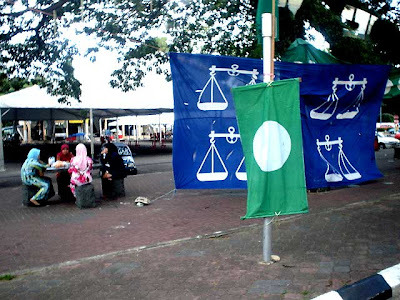 BN has literally smothered Port Dickson in banners, buntings and flags. 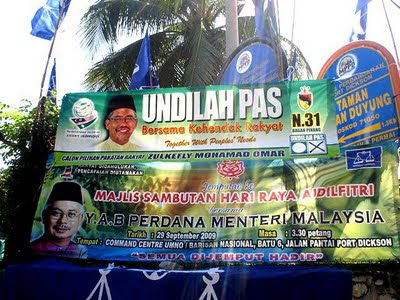 Obviously, Umno has spent at least four times more than PAS on the war of party insignia. Will voters recognize this as overkill... or will they be cowed, cajoled and bribed into voting once again for the morally bankrupt Barisan Najis? 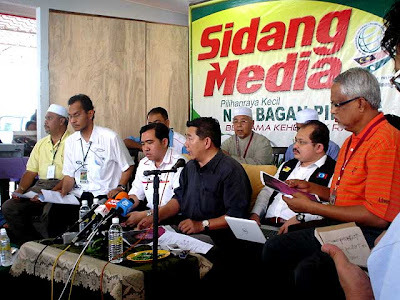 Salahuddin Ayob, PAS campaign director briefs the media on glaring discrepancies found in the electoral roll - particularly with the postal voters, hundreds of whom are also registered as "legitimate" civilian voters. With him are PKR Youth chief Shamsul Iskandar and PAS spokesman Mahfuz Omar. 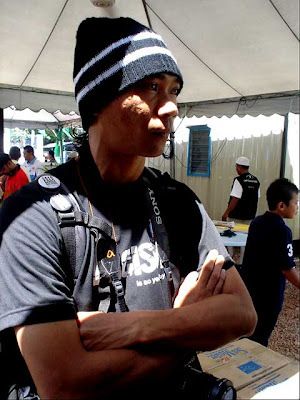 Salahuddin informs the media that nine PAS members were injured in a vicious attack launched against the PAS Youth information center around 3:30AM. One was badly slashed with a samurai sword just outside a police station (see photos here and here). There were also reports that a PAS member had been savagely beaten up yesterday afternoon by Umno supporters. 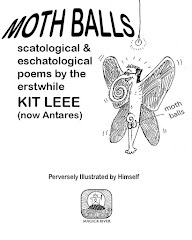 The press prick up their ears when informed about the nocturnal eruption of gratuitous violence. You can only attend so many ceramahs before you get tired of political speeches. 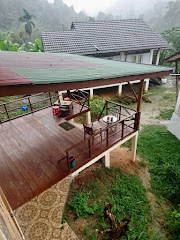 But blood has been spilled and word will quickly spread in Bagan Pinang that Umno instinctively resorts to violence when thwarted. 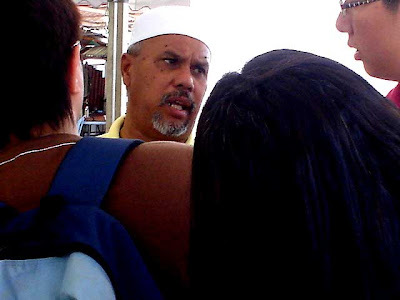 The severely injured PAS member has been warded in the Port Dickson hospital. We wish him a speedy recovery. 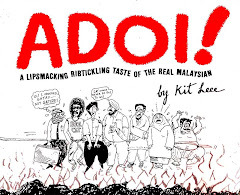 Major Rashid was aghast at the hooliganistic tactics engaged in by Umno. A Pakatan Rakyat vehicle parked along the road had its driver's door kicked in by Rempits. 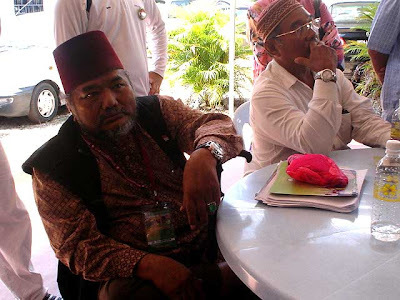 Is it any wonder why PAS needs its own dedicated and disciplined security unit? I enjoyed a brief chat with PAS campaign volunteers Suriah Narayanan, who came all the way from Ipoh, and Razali Lamun. 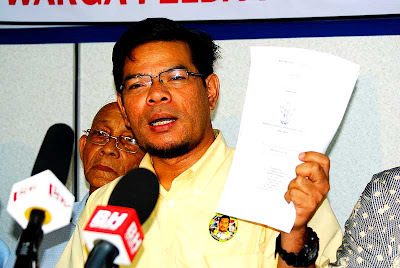 We came to a unanimous agreement that the political confrontation between Pakatan Rakyat and Barisan Najis had turned into a war between Human and Inhuman Values. Victims of Umno robber baron Isa Abdul Samad hold a media conference at the Negri Sembilan PKR office. 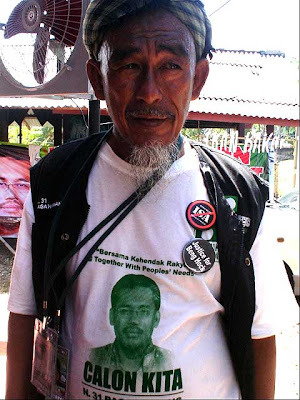 PAS supporters come in all shapes, sizes, and temperaments - but, mostly, they come across as decent human beings with downhome human values and a slightly rebellious nature. 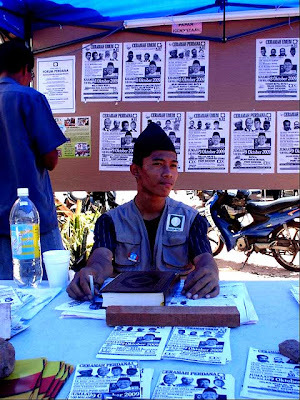 Local youth helps the PAS campaign by manning the information booth. 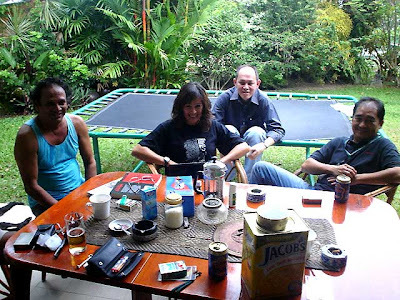 Blogger Central for the Bagan Pinang by-election. Heartfelt thanks to Alan D'Cruz for hosting the Special Bunch and everybody else who contributed to the cause by making us coffee, buying us lunch, serving us pumpkin soup and yogurt vadai - and generally being the best company anybody could possibly hope for. The general feeling about Bagan Pinang is that the odds appear overwhelmingly stacked in favor of Barisan Najis - but miracles do happen and even a 10-vote win for PAS would ensure the rapid demise of an utterly corrupt, arrogant and irredeemable Umno/BN regime. Let's pray for a miracle, folks. NEWSFLASH: Tomorrow, 9 October, Anwar Ibrahim will be making his rounds in Bagan Pinang. That should liven things up even more and perhaps turn the tide around. Who else but Anwar can get through to even those who are only beginning to wake up from 52 years of gross misgovernance? 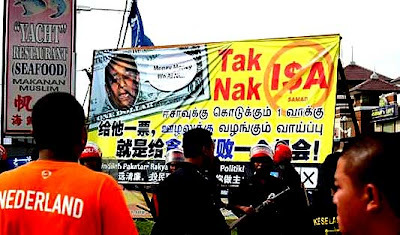 Port Dickson municipal workers dismantle a billboard put up in the heart of town by Pakatan Rakyat while a police light strike force stands guard. Pic courtesy of The Malaysian Insider. Ah...the man himself is there and I'm still struggling to reschedule duty just so I wont miss out of the real action. Buy-election adrenaline rush is playing pucks with orgasms ! Sheeesh man! See you tomorrow bro ! Eeee...... Why the septic spelling??? Good luck to you guys! As you said miracles happen so no matter what the outcome, you know you have "fought the good fight" against an evil & corrupted (err...sorry not corruped as it's only a technical matter to them!) regime! 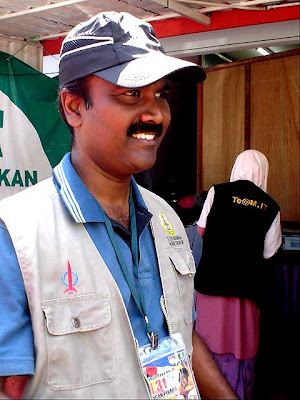 lets change Bagan Pinang to a better place..
u have my word Antares..
hey bro... missed u at PD..
looks like an uphill battle for PAS this time... ethnic indian voters are confused, divided, fed with angpaos & intimidation by BN.